Physical Therapy For Whiplash | Whiplash occurs when you have a sudden jolt, extension, or distortion of the neck. Whether it was from an auto accident or a fall, any sudden injury to the neck can cause problems, even if they are not detected for years. This is one of the reasons it is so important to visit your physical therapist for whiplash after an accident, even if you seem to feel just fine. Symptoms can range from discomfort to chronic severe pain that is accompanied by restrictions to your ability to move your neck or head. In fact, many people go for years after an auto accident before they feel the actual pain that was caused initially by that injury. 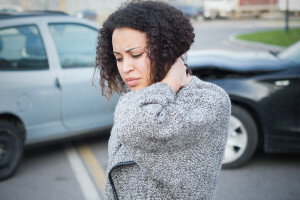 While there are many treatment approaches for whiplash, it makes sense to visit your chiropractor early on, since they are specialists on the spine and your neck is part of your spine. Depending on the extent of the injuries, your treatment plan may be for a short or long time. A combination of physical therapy and chiropractic care may be exactly what you need to recover. A complete examination that includes a medical history and x-rays will be done to help your chiropractor and physical therapist determine how bad the injury is and what needs to happen. Your chiropractor may begin with spinal manipulation or adjustments to begin getting the neck back into alignment. He may also include massage, muscle stimulation, and stretching or strengthening exercises. He will also talk to you about your lifestyle to help determine if things you do are contributing to the problem or the solution. The manipulation of your spine may take several visits over time. By slowly and gently manipulating your spine, he is allowing for the adjustment to strengthen before the next small adjustment is made, which means that over time the whole change will be stronger and will be more likely to stay in place. At home and may be shown how to perform specific everyday tasks without placing additional stress on the neck muscles as you go about your day. With our unique approach that combines physical therapy and chiropractic care, the specialists here at Fusion Rehab are here to help you recover from a car accident or injury that causes whiplash.